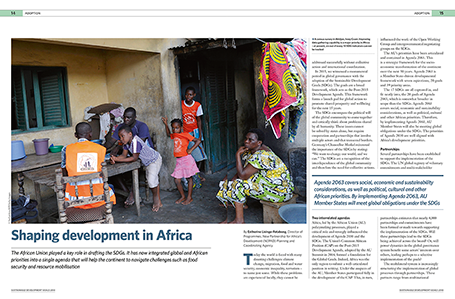 Published in March 2018, Sustainable Development Goals: Delivering change is the fifth edition in our definitive series on the post-2015 development agenda. 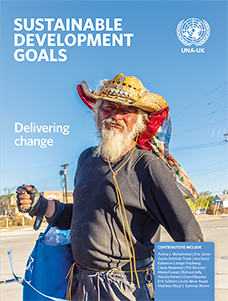 Written by the world’s leading authorities, it provides a thorough appraisal of how the new universal goals are being implemented and proposes strategies to deliver the transformation to which they aspire. The publication is edited by Natalie Samarasinghe, with articles from leading authorities, including Amina J. Mohammed, David Beasley, Achim Steiner, Ala Alwan, Louise Heaps, Guido Schmidt-Traub, Natalia Kanem, Marta Foresti and Summer Brown. The United Nations Association – UK (UNA-UK) is the UK’s leading source of independent analysis on the UN, and a UK-wide grassroots movement. UNA-UK believes that a strong, credible and effective UN is essential if we are to build a safer, fairer and more sustainable world. It advocates strong government support for the UN and demonstrates why the UN matters to people everywhere.